OSWEGO, NY â€“ Samantha McKie of Fulton put her talents to good use as she crafted a quilt for the Oswego Community Christian School. Oswego Community Christian School Principal, Debra Greutman (left) and Samantha McKie display a homemade quilt that McKie is donating to the schoolâ€™s auction. 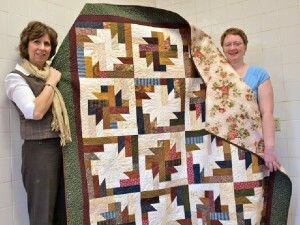 The handmade quilt will be one of the many items that will be available at the schoolâ€™s third annual auction to be held May 15 from 1 to 5 p.m. at the Oswego Armory, West First Street. The action, which serves as a fundraiser for the school, will feature a silent auction from 1 to 3 p.m. and a live auction from 3 to 5 p.m.
Committee members, who have been busy soliciting and gathering items for the auctions, were pleased to accept the donation from McKie. â€œThis beautiful handmade quilt is a wonderful addition to the many great items that will be available during both our silent auction and our live auction,â€ said committee member Patty Brancato. The quilt will be available through special drawing. Tickets for the drawing for the quilt will be available for $5 per ticket or three for $10 and can be purchased at the event. The auction will also include the Oswego Community Christian Schoolâ€™s annual prize drawing. For a donation of only $10 individuals will have the opportunity to win one of three great prizes including a grand prize of either a seven-night Eastern Caribbean cruise for two adults or a $1,000 Visa Card, winnerâ€™s choice; a second prize of a 40-inch LCD flat screen television; and a third prize of either a $250 gas or grocery card, winnerâ€™s choice. Food and refreshments will be available, including the Oswego Community Christian Schoolâ€™s famous chicken barbecue from 1 p.m. until sold out. For more information on The Oswego Community Christian Schoolâ€™s auction or to donate an item, call the school at 342-9322 or either Chris or Patty Brancato at 343-6220.